I have always been an athlete. Athleticism was a gift and when it came to sports I excelled in most all of them in elementary and HS. It was eventually a sport that fully paid for my college education. My playing weight for my last two years of college football was 235, my college baseball pitching weight was 210, I never had a weight problem until after college. I met my wife in college, our first date was to church, our second was running at the track. Sports seemed to open doors for me. Fast forward to 1985. After my wife and I married, I struggled with weight gain. Being able to carry weight well is not a blessing, it is a curse. When people would hear how much I weighed their reply was “you don’t look it” Their eyes did not match what their mouths were saying. At the age of 23 I was required to take high blood pressure medication. That should have served as a warning. Being told you need blood pressure medication should never be words heard by someone as young as I was. Hypertension at 23? Fifteen years later my athleticism was fading. I could still participate at 330 lbs but it was much harder to do so. It was in 2000 that I was diagnosed with diabetes, I also had sleep apnea and required a C-pap breathing machine at night. Each time I tried to lose weight, it was more like I misplaced it or hid it out of sight for a month or two. But it would always come back on. I came from a family with a history of diabetes and obesity and it looked like I was destined to follow in their footsteps. 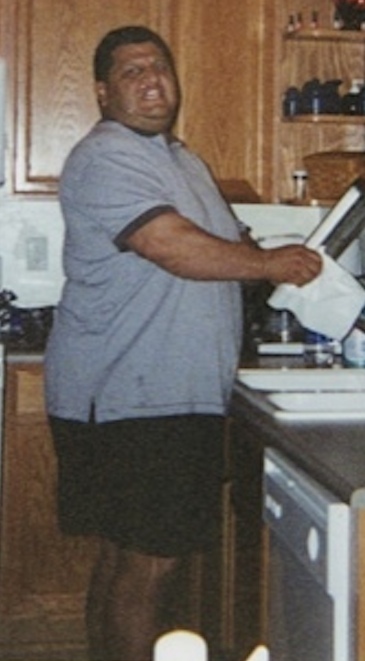 In 2001 my family moved to Phoenix, I was fat and happy. Two boys age 5 and 9 a beautiful wife, a new home. Life was good….NOT! Suddenly the family walks hurt; my ankles would swell for days. My kids adapted to the heat; my fat body didn’t. I instead stayed home and watched TV. The kids pleaded with me to join them. My wife pleaded with me to do something - anything! There were many nights she would cry during our conversations saying, “what about the boys?” I realized obesity was not as personal as I thought. My entire family was being affected by MY weight. I thank God my wife didn’t give up on me. By 2003 I was up to 400 lbs. I wore size 54-56 pants, size 21 shirts. I had to try to lose the weight, and so I did. Somehow I lost 40 lbs and I I felt better about myself. I even got up the courage to get additional support. With Thanksgiving just past and Christmas approaching I joined TOPS (Take Off Pounds Sensibly) on December 17th, 2003. I was very successful at losing until medical issues hit including back problems. I went into a downward spiral that seemed to never end. I gained each week, for months. Still, I went to my TOPS meetings how I don’t know. After being just 6 lbs away from my weight goal, I gained back 78 lbs of the 94 I’d lost. I felt like an athlete trapped inside a fat man’s body with no way to get out. Something was not right and I knew it. I sensed it and did not know how to get that positive feeling that was missing. I was not just taking medications for my ailments, but medications to counteract the side effect of those medications. How was I ever supposed to improve? I found a naturopathic doctor (NMD) and wrote to her, explaining the inside feeling did not match the outside body; something was missing. She answered my letter! I visited her and she did more than your basic blood test and found that my thyroid was non-functioning, a condition not very common in males. She made other recommendations also, and she monitored my progress. Our goal was to use medication as a temporary help not as a permanent fix. I began weaning myself off my medications as my health improved and I was started feeling better overall. I continued triathlon training and set my goal to do a full Ironman - a 140.6 mile race! After undergoing double carpel tunnel surgery in 2010 I had a lot of time to reflect. During this time I watched my high school friend complete his first full Ironman dream. What an inspiration! I still had my goal of completing one; but it wasn't going to before my deadline of turning 50. I saw not meeting the goal I had set as a setback - not a defeat. I continued training towards my goal. On Nov. 18th 2012 at the age of 51 I officially became an Ironman. I completed the 140.6 mile race in under the 17 hours allotted. It took me 15:48:24. I met my TOPS goal weight that year of 260 pounds. It was exactly 9 years to the date when I hit my highest weight of 400. I was at goal and the total difference was 140.5 pounds! I still have a hard time believing this is a coincidence, more of a sign it was just meant to be. Each mile I had completed in that Ironman was like trampling over each pound I’d lost. Most of all I had FINISHED something. I think the training process taught me another lesson. By doing a little each day and working consistently you achieve more than working full speed in an all out dash to the finish, only to fall back and need to restart the process over again later down the line. I have set new goals and want to inspire others who might be in my position or worse not to give up. I believe the harder we work the luckier we get. My current goal is to complete ten full Ironman races by age 60 (with any luck one of those will be in Kona). One of the ten to be an international race, that will take place March 2015 in Taupo, New Zealand. I still struggle with balance of exercise and food, I have to always remind myself we eat to live, not as I had done in the past, lived to eat. Two years later and 140 lbs less some might say I still have a ways to go. At 260 I am still 100 lbs more than the average triathlete. Yet, I am still healthier for doing what I do, I am no longer dependent on any sleep aids, diabetes or blood pressure medication, and have extended my life. To me that is what matters the most and gives me comfort knowing I can spend more years with the ones I love.